The “no suits allowed” event called Reaganpalooza began 13 years ago as a time to meet with friends and celebrate the conservative movement by honoring President Ronald Reagan’s legacy. Since that first gathering of just 40 people, the number of attendees has grown to over 500, and has become the event that closes out the annual national Conservative Political Action Conference (CPAC). Bold is proud to be a co-sponsor of this event this year. A celebration to honor Reagan’s legacy is especially relevant today, at the beginning of the Trump presidency. Reagan won over the American people with a promise to lower taxes and create more jobs, a very similar message that we’ve heard from Donald Trump. Christopher Malagisi, President of the Young Conservatives Coalition, recognizes that this is not the only aspect of Trump’s campaign that was derived from Reagan. Certainly Reagan’s idea that “government is the problem, not the solution,” is held by Trump. How about the slogan, “Make America Great Again?” Malagisi stressed how Reagan used this same phrase throughout his campaign for president. 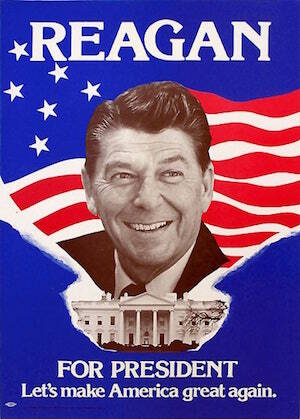 Check out this campaign poster from 1980. Reagan resurrected the economy, and after signing the Economic Recovery Tax Act of 1981 and the Tax Reform Act of 1986, America had the lowest individual and corporate income tax rates of any major industrialized country in the world. Millennials don’t know much about Reagan because they weren’t alive at the time of his presidency, but his administration remains relevant. Ekins said Millennials “don’t really remember the Cold War. They are more supportive of socialism but without the knowledge to accompany why.” An October YouGov survey on the American people’s basic knowledge of communism found the Millennial and Gen Z age groups are favoring Communism over Capitalism, and a rising number thinks Communism was only a 20th century problem. There is a desperate need to inform younger people of our history and to stress Ronald Reagan’s significance in today’s America. As Malagisi stated: “You can’t understand modern politics without understanding what the Reagan Revolution was.” The founders of Reaganpalooza realize this, and they will continue to honor Reagan’s legacy through it. Learn more about Reaganpalooza 2017 here.